(Ramapo, NJ—December 2, 2017) The Ramapo College of New Jersey (RCNJ) Film Festival has awarded Best Cinematography to David Mansour of Bayonne and Best Narrative to Hoboken’s Colm Donston, announced Dr. Joseph Giammarella, Principal of High Tech High School. Mansour won for his film Dream On. Donston earned his award for his film Solitaire. Give Love by Carlos Hernandez of Jersey City and North Bergen resident Sophia Abraham, Black and White by Ivanna Guerrero of West New York and Jersey City resident Amirah Johnson, and First Day by Alana Aninipot, a Secaucus resident, had received nominations as well. High Tech alone had secured five films in the festival out of a total of 20 selected by the festival committee. 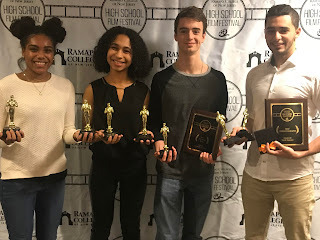 The RCNJ Film Festival took place at the School of Contemporary Arts on the college campus and welcomed everyone from all walks of life to the screenings.